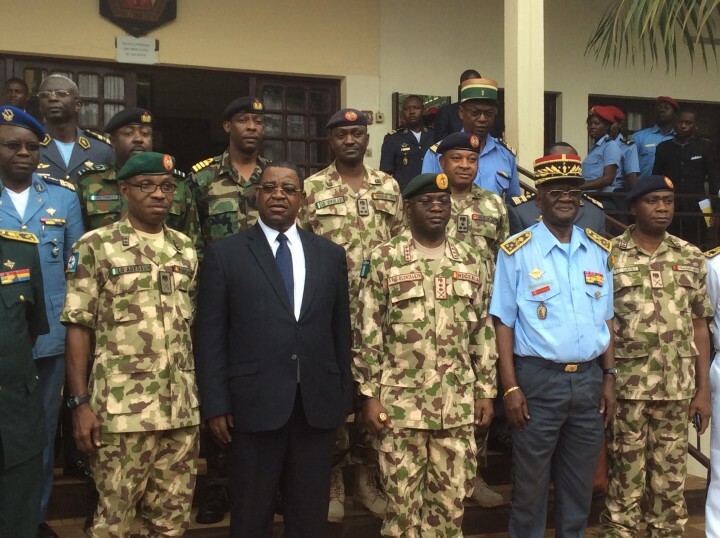 In an effort to strengthen the existing bi-lateral cooperation with Nigeria’s neighbours, the Chief of Defence Staff, General Gabriel Olonisakin has embarked on official trips to Niger Republic and Republic of Cameroun where he met with the top Government functionaries of the two countries. This was made known in a press release made available by the Acting Director Defence Information, Brig.Gen Rabe Abubakar on Friday. The statement said, while in Niger Republic, General Olonisakin met with the President of the country, Mahamadou Issoufou as well as the Chief of Defence Staff, General Seyni Garba where discussion on issues that concern the two friendly countries were highlighted. It said General Olonisakin thanked the Niger President for the role the country is playing in counterterrorism operations in Lake Chad Basin and the country’s role in the formation of Multi-National Joint Task Force (MNJTF). The CDS expressed delight that Boko Haram has been significantly decimated, a feat which called for stronger ties between Nigeria and its neighbours to ensure that no safe haven is provided for the retreating Boko Haram terrorists in the sub-region. To this end, General Olonisakin solicited for improved intelligence gathering and sharing, air asset operations and counter-Improvised Explosive Devices (IEDs) operations within the Lake Chad Basin countries and across ECOWAS States. While in Cameroun, Nigeria’s CDS was received by the Camerounian Honorable Minister of Defence, Edgard Allain Mebe Ngo’o and the country’s Chief of Defence Staff, General Rene-Claude Meka where similar discussion, as in Niger Republic, occurred. One of the highlights of the discussion in Cameroun however, was in the area of stronger cooperation in maritime environment, especially in the Gulf of Guinea, to tackle the incessant case of bunkering, oil theft and piracy. General Olonisakin has since returned to Nigeria.